The Great Northern Railway of Ireland maintained an independent existence for 77 years, much of that time prosperously established as the second largest and certainly the most enterprising of the Irish railway systems. Springing from the need to link Dublin and Belfast by rail, the Great Northern was the result of amalgamation of numerous smaller companies. The system began in the mid-1830s. Ireland’s population had by then risen to more than eight million, and it was increasing. Dublin was the capital and the only considerable city, but Belfast had embarked on industrialisation and was growing at a phenomenal rate. Between the two places the best means of communication was by coach, a 100 mile journey over rough roads. It took longer indeed to travel between Dublin and Belfast than it did to cross from either in a small vessel to the port of Liverpool. Perhaps because no gathering of company promoters could be assembled who would agree on such a far-sighted railway policy; the Dublin-Belfast link had to be forged piecemeal. Rail access to Londonderry was similarly done in stages. Between these routes, the Ulster Railway had reached Clones, which was already on the course of the Dundalk & Enniskillen Railway. Secondary and branch lines were supplementing these main routes. Amalgamation of the four main line companies of the area took place in 1875-76. The disaster of the Potato Famine initiated wholesale emigration from Ireland, and in the course of a century the population shrank by half. So it was that the Great Northern was presented with the difficulty of paying its way. In spite of this the Great Northern was at its most prosperous in the 30 years or so preceding the First World War. The political and technical changes which followed that conflict produced a rapid change in fortunes: the political division of Ireland, civil war, tariff restrictions, and above all the development of road transport. Falling receipts and soaring operating costs brought the company to its knees shortly after the end of the Second World War. Five years of shared nationalisation followed, during which much of the system suffered closures. In 1958 what was left was divided and administered thereafter by the Ulster Transport Authority and by Coras Iompair Eireann. 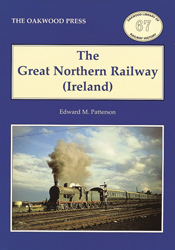 First published in 1962, in this new edition of The Great Northern Railway (Ireland) Dr. Patterson’s text remains largely unaltered, except where more recent research has revealed new data. Appendix One (List of Stations and Halts) has been significantly revised and updated. No attempt has been made to include a history of the former GNR(I) lines under UTA/NIR/CIE/IE auspices. A5 format, 240 pages, 190 illustrations.